It’s snowing big heavy flakes tonight! 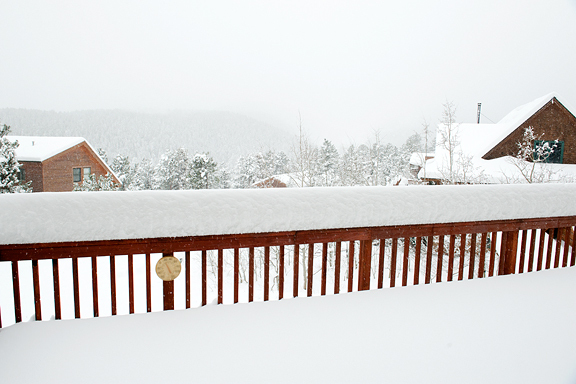 We have seven inches of snow on our deck right now and I’m thinking a little backcountry ski might be in my near future. I’m ready for a little break as it has been non-stop around here since I returned from California. I had to test out some new equipment that arrived while I was away and of course, the guinea pig’s name is Kaweah. Kaweah got a brushing, then a (much-needed) bath, and another brushing. It wasn’t for the photo, it was because she was shedding her winter coat all over the house and because she had her stink on BIG TIME. A client shoot kept me off the streets and up late at night earlier this week. The first day of the shoot we were staged at Chris Cina’s newly-opened restaurant (Hideaway Steakhouse). I cannot wait to actually EAT there because Chris is the chef and if you’ve ever visited his website (gorgeous food, gorgeous photography) you’d want to eat there too. Not only that, but Chris is one of the nicest people ever. The second day was in the home studio – just me, lots of food, and Kaweah following me around waiting for a peanut or carrot to drop. 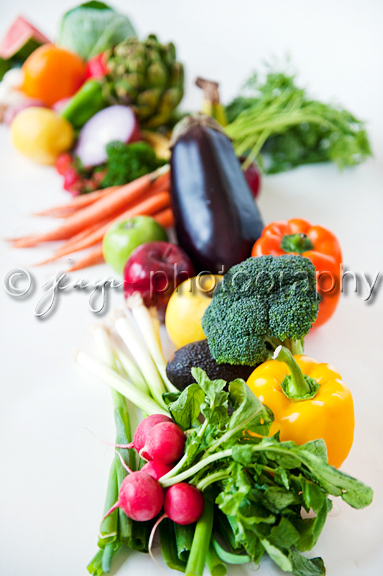 how can you not love fruits and vegetables? 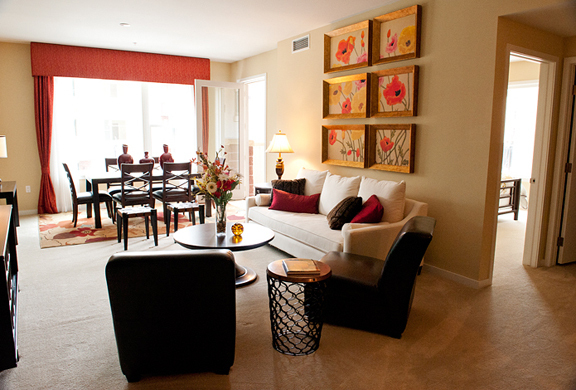 And then there were the property viewings… We are not moving anywhere! I hate moving. I hate house hunting. I can barely stay awake to shop for clothes for myself let alone a house. But you see, I have a big incentive to look for a nice place in town because it means my parents will come and hang out in Colorado. Last summer they visited us and scoped out a few properties, then they wined and dined around town and really enjoyed themselves (Dad LOVES The Kitchen – who doesn’t?). That is important to me because I want them to be happy, but I also want them to eventually live here year-round so I can take care of them and be there for them as they age. That’s what Chinese daughters do. That’s what Kris and I would have done together, but now it’s just me. Of course, at my parents’ rate they will be hiking the fourteeners well into their nineties! All of this has conspired against me cooking any of the lovely vegetables I picked up this weekend with grand plans to make some dishes I’ve been craving. It’s been simple food like sautéed English peas, eggs, toast, vegetable soup, grilled green chile & swiss cheese sandwiches. So let’s dig deep into the queue and get a recipe for my favorite Chinese fried rice recipe that I shot in 2008. I know – where the heck has that been hiding? It’s been hiding in my February 2008 cooking photos folder. I document, archive, and save *everything*. I’ve been making this fried rice since college and I’ve been eating it all my life. I think this is my mom’s recipe and it’s most certainly one of my comfort foods. It’s also one of Jeremy’s favorites so I like to make a batch for him before I go on travel. As with most Chinese dishes, this one is mostly prep-intensive and quick to cook. They also make great leftovers. Chinese fried rice can be anything you want. In most Chinese restaurants, it’s where the leftover ingredients go along with extra rice. That’s not how I roll. I don’t add random ingredients to my fried rice just to use up leftover stuff. I like this combination: pork, onions, preserved mustard green, egg, rice. It’s always worked for me: settles my tummy, makes a good day even better, reminds me of all the great food I grew up eating. You can use brown rice instead of white rice – I’ve cooked with both and the brown rice is nuttier and better for you. I like both kinds. The basic procedure is to cook everything one at a time and then mix it all together in the end. I just try to minimize the number of dirty dishes I generate. Simple, quick (especially if the rice is already cooked), and a big stupid smile on my face. i like my rice sticky – i’m chinese! 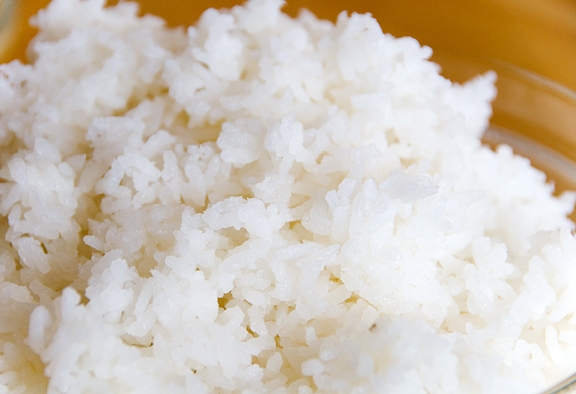 Steam the rice in a rice cooker or on stove top until fluffy and sticky. 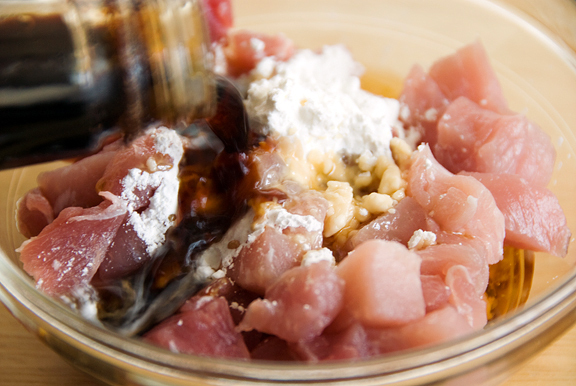 In a medium bowl, combine the pork, soy sauce, sesame oil, and cornstarch until the pork is evenly coated. Set aside. In a large sauté pan (I use my stock pot when making this much fried rice otherwise the rice goes jumping out of the pan when I stir-fry it), heat a tablespoon of vegetable oil over medium high heat. 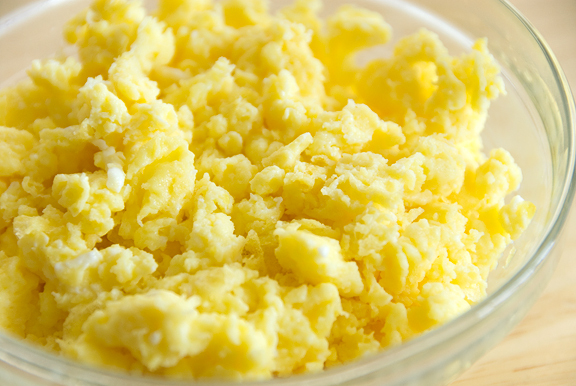 When the oil is hot, pour in the beaten eggs and scramble until cooked through. Remove from pan and set aside. In the same pan, add two tablespoons of vegetable oil over high heat. When the oil is hot, sauté the onions until translucent. Add the mustard greens and the pork. Stir-fry the pork until cooked through. Remove from pan and set aside. Heat two more tablespoons of oil in the pan over high heat. Place the cooked rice into the pan, breaking up clumps and stirring it around to avoid burning (but browning is good!). When the rice is mostly broken up and evenly fried, add the pork mixture and the eggs to the pan and stir-fry until heated through and mixed. Serves 8 (at least). Thanks for sharing your Chinese Fried Rice recipe. It looks wonderful! Fried Rice seems to be one of the Comfort Foods that is a comfort even to those who didn’t have it as a child. I never thought to use preserved vegetable in fried rice. Your photography is so beautiful. 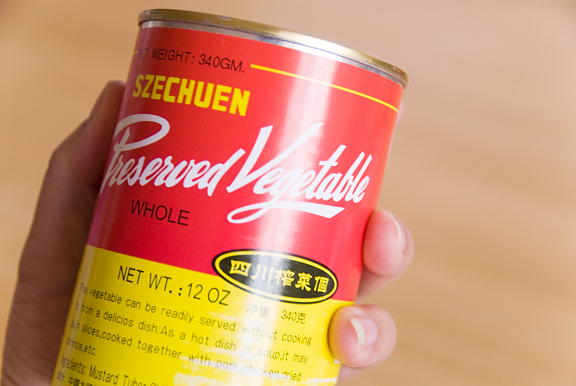 And I don’t think that label has changed since the company started canning, it is the same as when I learned to cook Chinese recipes in the 70’s. I’ll be lost if they put it in plastic pouches, unless they keep the graphics. Such a sweet puppy portrait, Kaweah looks as if she is waiting for a toy or a treat. I like my rice sticky too! Ive always made fried rice without egg, sometimes I’ll add a fried egg on top (my grandparents were indonesian) because I don’t like the way the egg sticks to the rice and turns brown from the sauce. But it never crossed my mind to cook the egss seperately, going to try that for ure. Thanks for sharing! I always enjoy that you bring to the table a cusine that I am not that familiar with. It is always refreshing to branch out. I can wrap my head around this one. Thanks! Kaweah looks so gorgeous! Such a shiny coat. I lost my beloved boy, Diesel, just before Christmas and my heart melts at the sight of every Black Lab. Yours is especially lovely — I wish her a long and healthy life! I love how you only need a few ingredients to make this! I’ll have to add this one to my dinner list! Thanks for the fried rice recipe. 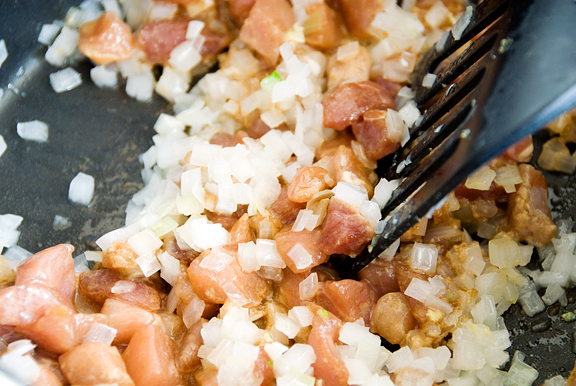 We love fried rice but have never gone to the trouble to research a good one. We will definitely try this out soon with some pigs that are almost ready to go to the butcher! Fried rice is the best! I usually add BBQ pork to mine and since it’s already cooked, it’s even easier. I love your recipes.. am going to try some. I’m a breast cancer survior too.. Hope you are doing well. My fried rice is probably considered a little odd. I add turmeric raisins and pine nuts. I love this recipe! But I love that dog even more! Yum. Can I come to your house for dinner? It’ll only be at least 20 hours by car + however long it takes to navigate all that crazy snow. While you are getting snow, we are getting near-90 degree days and thunderstorms complete with hail and tornadoes. Oh my, another food to find and enjoy, preserved mustard greens (I love the fresh ones). Miss K., is such a beautiful doggie. That photo stopped me in my tracks. I believe I caught a glimpse of her soul in that pic. Precious! Never made it with mustard greens before – it’ll be a great addition to my standard. Thanks, as usual, for great photos and ideas. This recipe looks totally yummy. I love chinese rice and am lacking a good place to get some near by. Do you think they sell preserved mustard greens at regular grocery stores or should I try the asian market? Maybe I could use green onions in their place? I’m not sure what the flavor is like for preserved greens. Kaweah is so beautiful; what a sweet face! The company I work for just launched a line of dog collars. I’d love to send a few to you. E-mail me your mailing address and I’ll send ya some. I’ve just started learning more about stir-frying and fried rice. I heard that you can / should use day-old rice. Do you do that? Also – I’ve never seen the preserved mustard greens around. But, our markets sell a lot of fresh mustard greens. Does anyone know a way to sub in fresh greens? The first photo just made me really home-sick! Fried rice is something I’ve never mastered. My half-Japanese bf loves it, but he doesn’t cook so he never gets to have this! ;-) I will try your recipe next time, it looks great! We love fried rice in our house. You can add anything leftover in the frig and it always comes out delicious! No need to use day-old rice, as long as the rice is cool or cold, then it will do well. 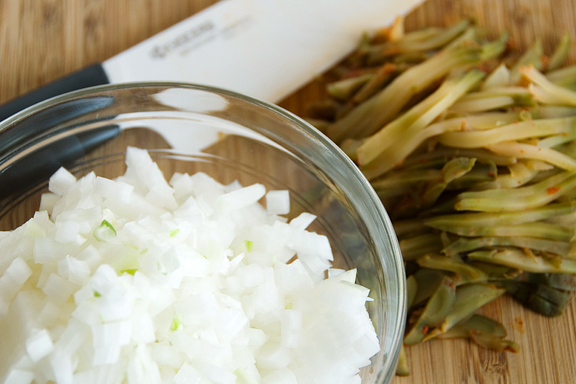 As for mustard greens, you can use chopped celery instead, which also adds good color and flavor to the fried rice. One can also use chopped ham (leftover of the Easter dinner) to substitue pork. 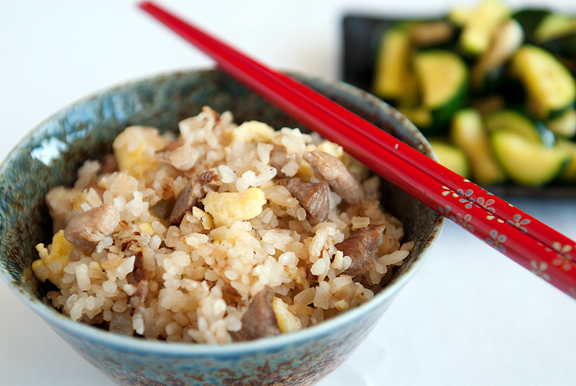 Fried rice means a quick fix for a simple filling meal. Preserved mustard greens are one of those ingredients that I never remember to buy but love the taste of when I eat a familiar Chinese dish. What a nice way of giving fried rice an extra flavour dimension. Unlike you though, I only make fried rice when I’m using up bits and pieces in the fridge. sam – you’re right, I don’t like the way the egg turns brown either. I guess that’s why I’ve always cooked it separately – hee hee. Joy – I’m a fan of the za cai too! Cookie – mmm, if I had bbq pork readily on hand I’d be all over that too! Barbara – wow, that sounds awesome! Sarah Hope – I certainly hope you guys didn’t suffer any damages or injuries! 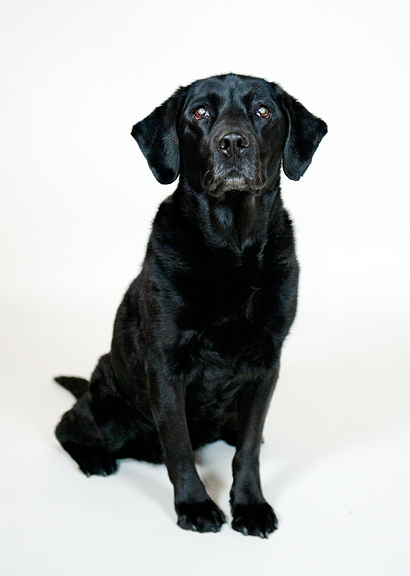 Margie – she’s getting older and grayer, but she’s still my baby puppy. Shelley – Most regular grocers don’t carry preserved mustard greens (that’s I’ve seen anyway). Best bet is to try the Asian market and ask. Green onions would be a poor substitute, but since it’s fried rice, you can add anything really. The preserved mustard greens are salty and ever so slightly spicy and crunchy. 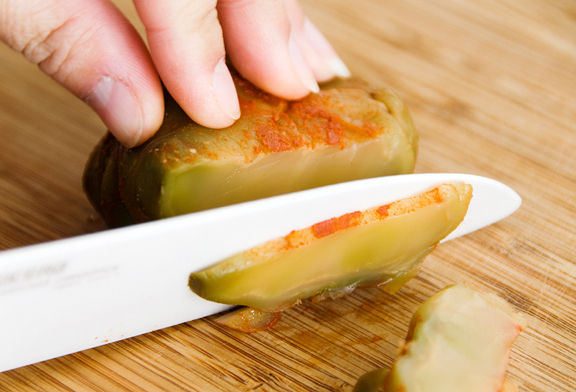 Great texture, but they add a nice flavor. withinseason – That’s what I’ve heard. I sometimes use day-old (or 4 days old) rice, but there are times when I make the rice, let it cool, then dump it into the pan :) Fresh mustard greens won’t be the same. See the comment above – they are salty and have a certain flavor. There is also a sour mustard green (pickled) which is different but also really yummy! What a wonderful daughter you are. I feel a little concerned about the future as my mum is on another continent from me, and my brother is on yet another continent. I hope one day we’ll find that we can all live at least a few hours apart. Finally found the right preserved mustard green in the asian grocer and made this today. Holy god that’s a LOT of fried rice!!! It’s awesome. Thanks! I made this tonight, using Cookie’s suggestion, I used leftover shredded BBQ pork. Unfortunately, I made this impromptu and didn’t have the pickled mustard greens. Another substitution which I’m sure wasn’t optimal: green onion and celery. In spite of all this, it was a wonderful fried rice. I wholeheartedly endorse your method! I used brown rice and it was great; none of the local Chinese restaurants offer this. This version was light and delicious without the oiliness that some restaurants serve. Next time I’m in town, I’ll be sure to look for the preserved mustard greens.Thanks so much! I am using this recipe tonight. Unfortunately our small town has no Asian market. I am using scallions and a bit of diced red cabbage for color. Also using chicken instead of pork. I estimate that we spend over $250 a month on frozen fried rice and none of the buckets, boxes, and plastic bags really hit the spot. Hopefully making this and freezing it for microwave use later on will satisfy our cravings and save some money.We are on a fixed income and fried rice is our go to meal. It is comfort food, fast food, and we love it. We never get tired of it. It’s just that since we left the city and went “rural” we haven’t had a good serving of it. I hope this does the trick! Sure sounds like it’s going to. So far ALL of your recipes have. As a former west sloper you have my thoughts in the winter time. I lived in Ouray so when I got really cold, I ran to the closest natural hot spring. We would sit back and watch the ice climbers. But alas, the ice is melting. God bless and stay warm.